These fabled sirens of the deep were known to lure sailors away with their enchanting songs only to drag them to their demise deep below the waves. 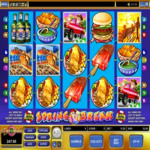 Thankfully, the finned ladies of this game from Microgaming seem to have a different thought in mind– like giving you hours of jackpots and bonuses. Neptune- The God of the Sea is taking a little less prominent role as the wild symbol for this game. He will replace any symbol except for the scatters and the bonus game symbol for a winning combination. Mermaid- These ladies of the deep take their place as the scatter symbol for Mermaid Millions. The scatter is rewarded by using the given bet size multiplied by the amount represented on the active pay line. 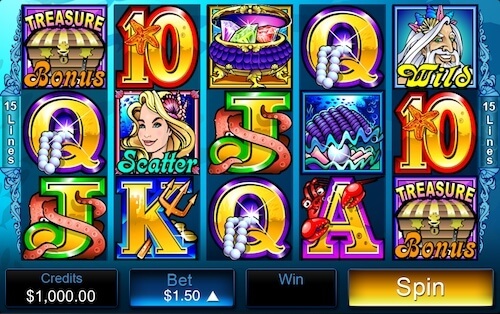 If 3-5 Mermaids land, you receive 10 free spins, to which all winnings are tripled. What’s really fun about this, is that this game allows for even more free spins to be won during those free spins, a fun feature not often found. Treasure Chests- Three chests land on your active lines, and it’s time for the bonus game. You are presented with an assortment of treasure chests and other containers, from which you can choose three. Each one contains a prize, and the total if your booty to keep!